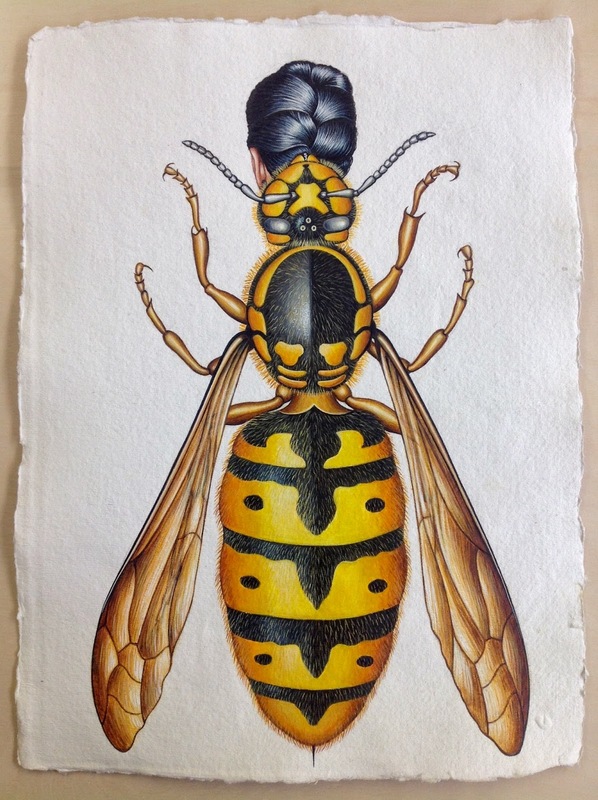 The watercolour, Wasp Woman was begun, but not quite completed, during my term as artist in residence at the Art Vault in Mildura last December (see Blog Post Friday, December 12, 2014). After the residency ended, Christmas and all its attendant distractions intervened, and then there were further insect women waiting to be documented. 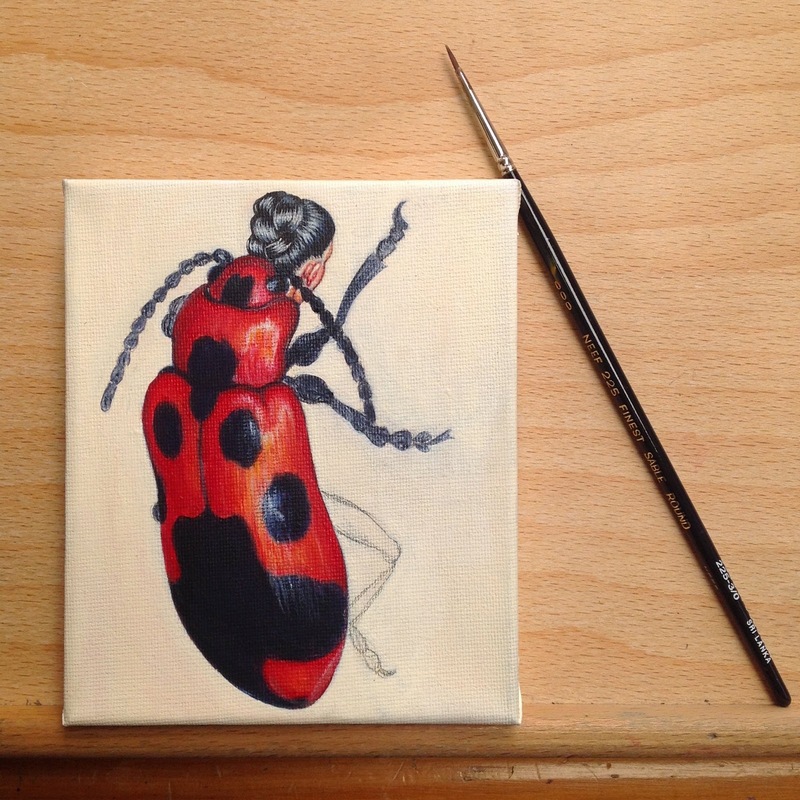 It’s only now I’ve had a chance to add the finishing touches to this homo-insecta and give the sting in her tail one last polish – just in time for her to partake in the wasp plague currently upon us in Ballarat. and gouache on Khadi paper, 41.91 x 29.72 cm. 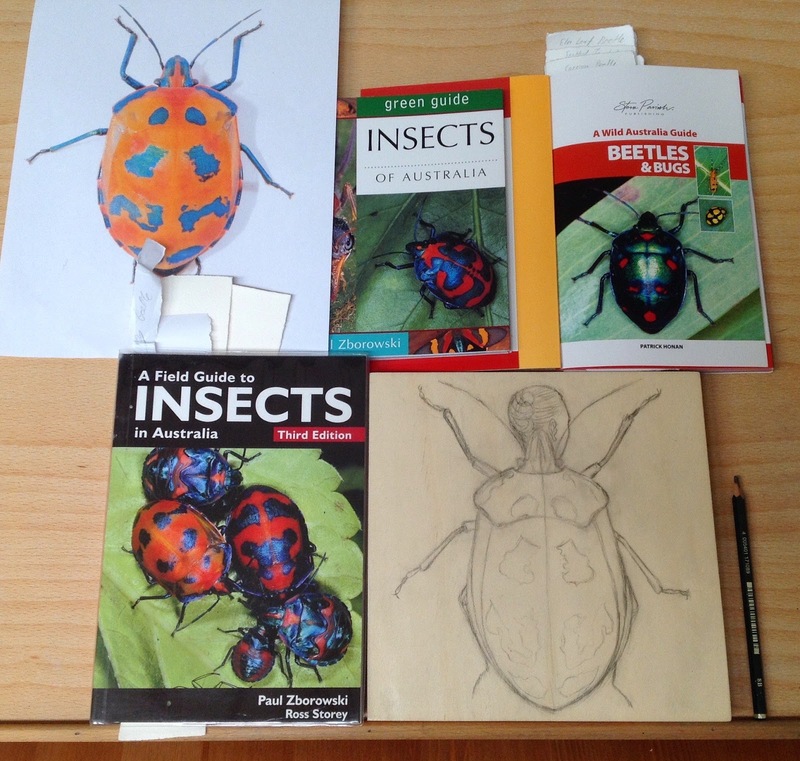 Now full-fledged, Hibiscus Harlequin Bug Woman (Tectorcoris diopthalmus homo-insecta) shows her true colours. Directly below: selected views of the documentation process. (For more, scroll down to previous post, Saturday, March 21). AKA Tectorcoris diopthalmus Woman and Cotton Harlequin Bug Woman, this luminescent Homo-insecta hails from Northern and Eastern Australia, New Guinea and several of the Pacific Islands. Adult females are predominantly orange with blue patches, although the colours vary considerably. The female of the species is larger than the male. 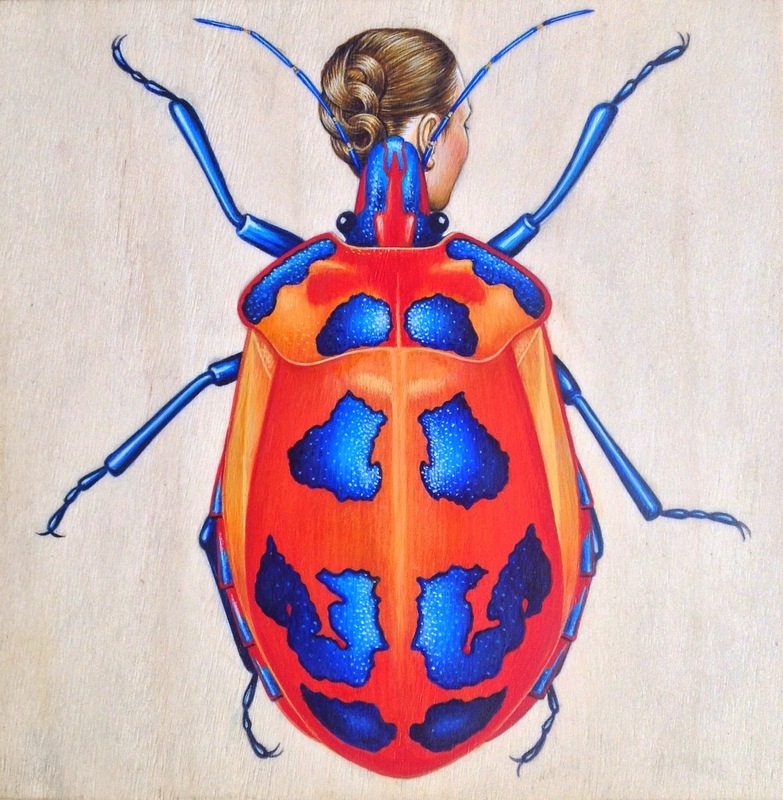 The Hibiscus Harlequin Bug Woman feeds on several species of the Hibiscus family, cultivated cotton, flame free flowers, grevillea and bottlebrush saplings. 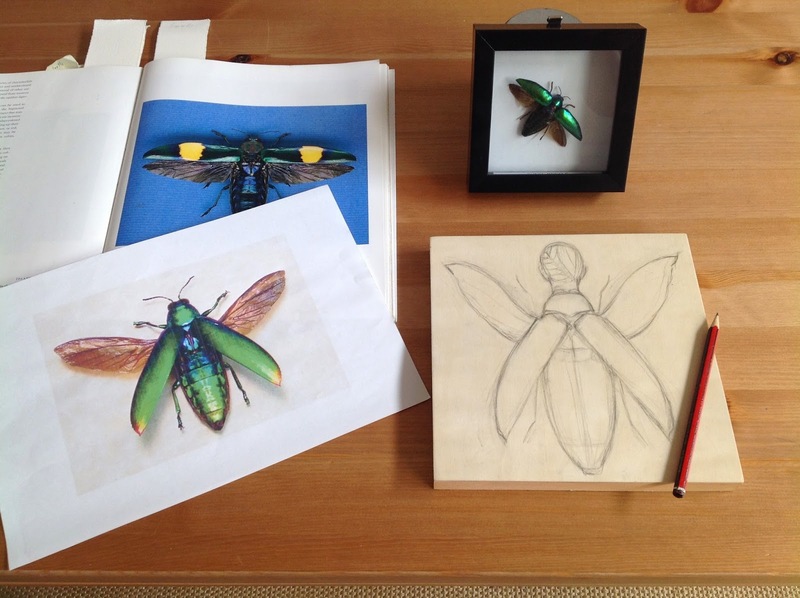 Base: Homo-insecta - An Unnatural History Portfolio, 2013, artist book, hand coloured linocuts and inkjet prints, 33H 24W x 1.5D cm, edition 2/10. An installation view of Between the Sheets, the international artist books exhibition that includes my unbound book, Homo-insecta (foreground, right) inset below with the front cover and selected page views. The exhibition opened on 7 March and runs until 2 April. 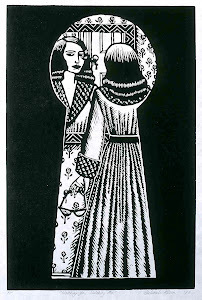 For full details of the exhibition, visit Moth Woman Press HERE. Further to my previous post, which focused on the newly completed Jewel Beetle Woman (Sternocera aequisignata) I now present my Muse: Dame Ellen Terry (1847-1928) as Lady Macbeth, a role she famously performed on the West End of London in 1888. Amongst the crowd on opening night was the painter John Singer Sargent (1856-1925) who later persuaded her to sit for him. An eye witness to Terry’s arrival at Sargent’s Chelsea studio was none other than Oscar Wilde, who remarked: “The street that on a wet and dreary morning has vouchsafed the vision of Lady Macbeth in full regalia magnificently seated in a four-wheeler can never again be as other streets: it must always be full of wonderful possibilities." Alice Comyns-Carr designed the gown, which you can read about HERE. Ada Nettleship crocheted it from a combination of soft green wool and blue tinsel yarn from Bohemia that was primarily intended to evoke chain mail, whilst also suggesting the scales of a serpent. 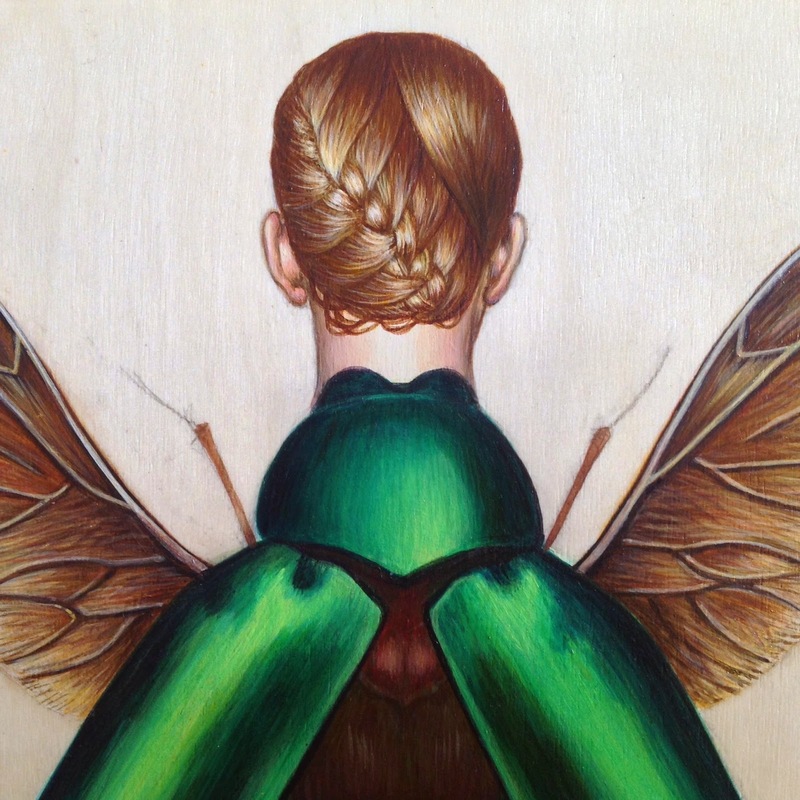 The dress was sewn with 1000 iridescent wings from the green Jewel Beetle Sternocera aequisignata. Terry kept the ‘beetle dress’ for the rest of her life and sometimes wore it on special occasions. The gown now resides in the permanent collection of the Ellen Terry Museum, Smallhythe Place, near Tenterden in Kent, UK. I first visited this beautiful museum, which was formerly Terry’s home, in the mid-1970s and returned in 2011, soon after a major restoration of the gown had been undertaken. You can learn about it HERE and HERE. 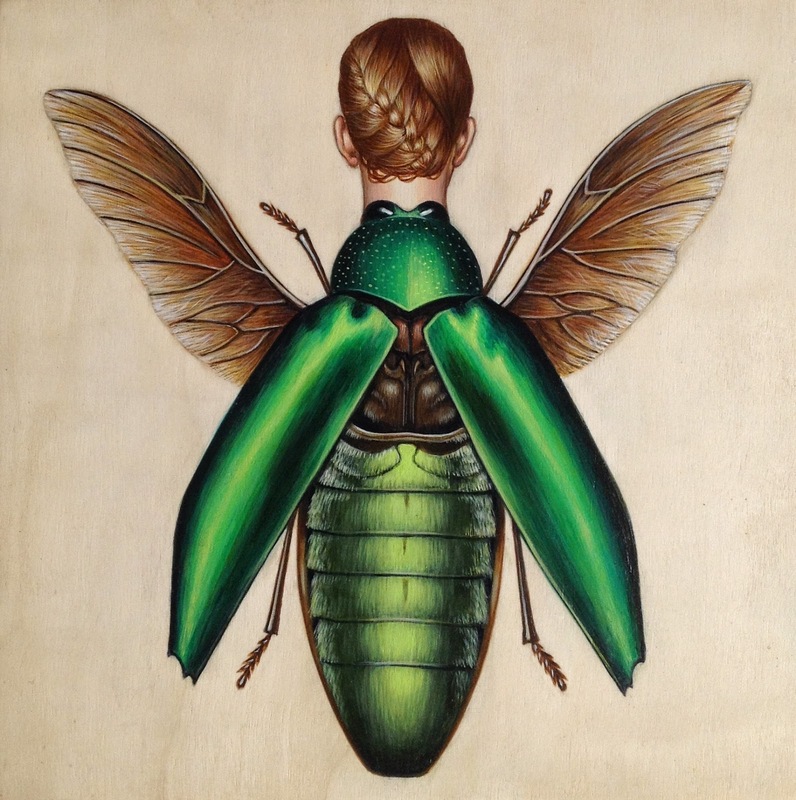 Now fully-formed, the newest member of the Homo-insecta species makes her debut appearance below, followed by further details of the documentation process. (See also previous post, Sunday, March 8). 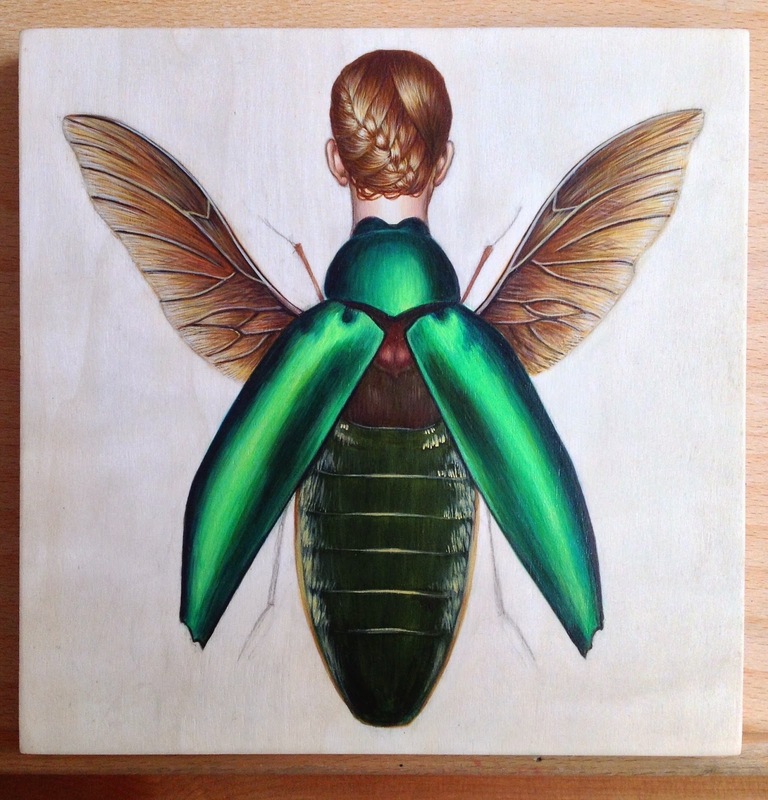 Early stages of Jewel Beetle Woman (Sternocera aequisignata) 2015, acrylic and pencil on wood, 20 x 20 cm. 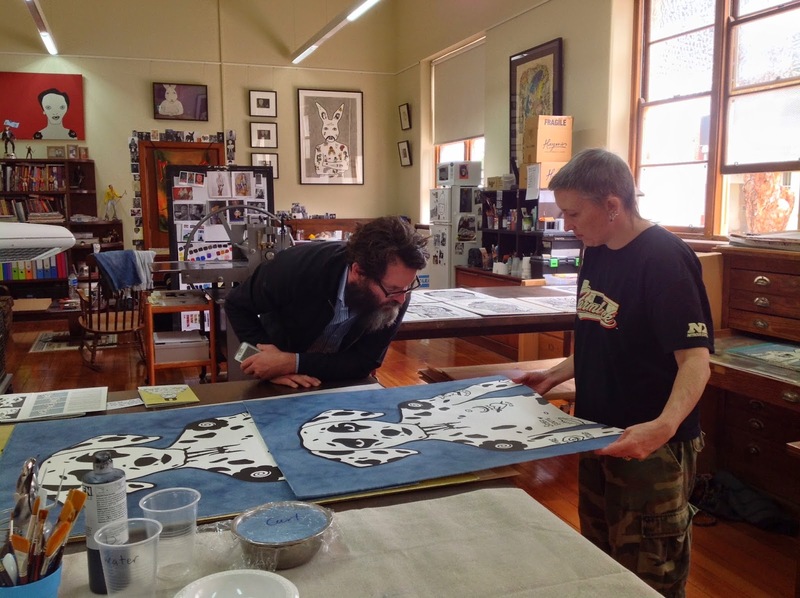 Yesterday afternoon (Monday, 2 March) I met with printmakers Clayton Tremlett and Rona Green at Rona's wonderful studio in the Mercator Building, which is part of the extensive Abbotsford Convent arts complex. 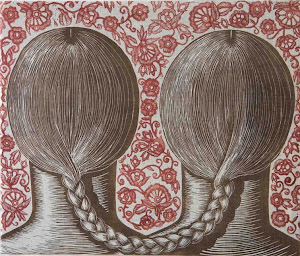 Clayton is the curator of Inking Up, a forthcoming exhibition at Castlemaine Art Gallery and Historical Museum; it will comprise linocuts by the three of us, all on the theme of the tattoo. Inking Up will run from 29 August - 18 October. Full details will be posted nearer the time. The following photos were taken during the initial selection process. 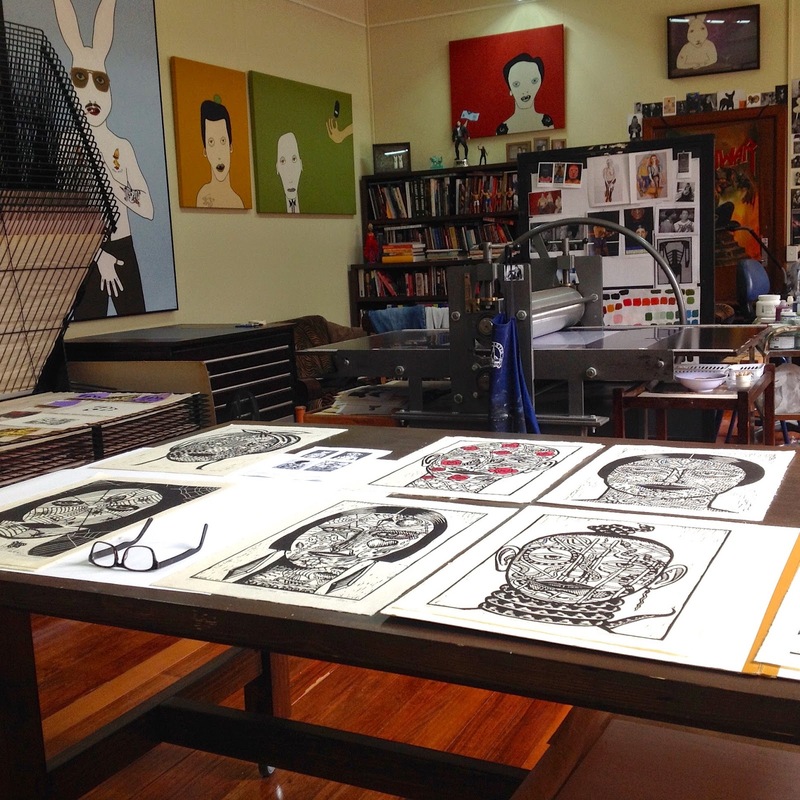 Foreground: a selection of my Tattooed Faces linocuts (mid-1990s). Artworks on the walls are by Rona Green. For a great many years I've been drawn to portrait miniatures, particularly those produced in the sixteenth century by two of its finest and most celebrated exponents, Nicholas Hilliard and his pupil, Isaac Oliver. 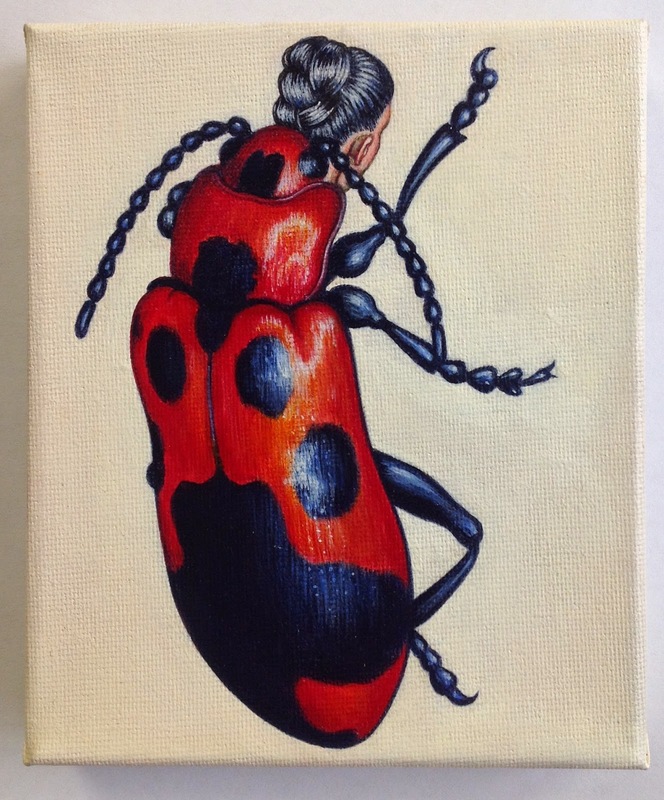 Completed just a few days ago, Red and Blue Leaf Beetle Woman draws equally from my personal iconography and the tradition of cabinet painting, which came to prominence in the late 1580s. Diminutive, but larger in scale than portrait miniatures - the majority of cabinet pictures measure up to 24.5 centimetres (10 inches) in height and typically present a full-length, highly detailed view of the subject. Collectors stored these intimate works in a "cabinet", a small private room that sometimes served as a study. (The name "cabinet" originates from the Italian word for room). In later years cabinet paintings were housed in display cases that were also known as cabinets. 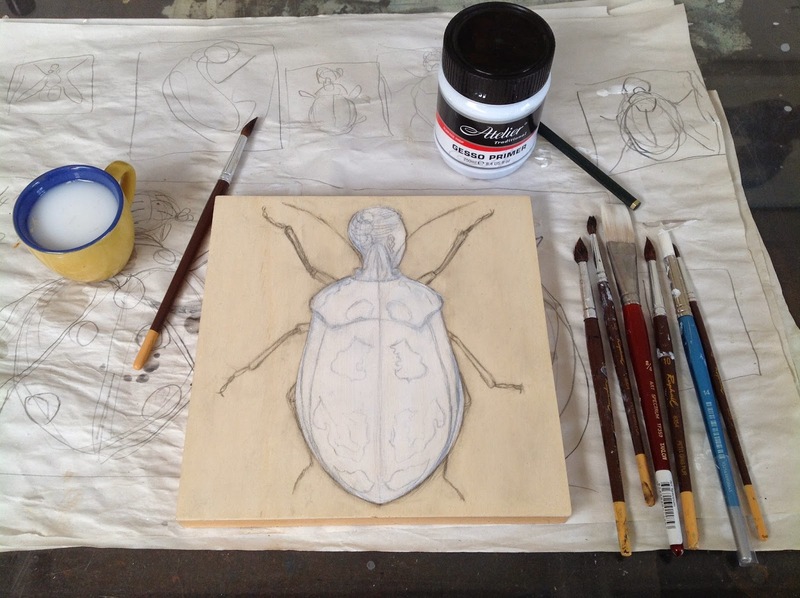 Discover more about the fascinating subject of cabinet painting HERE. 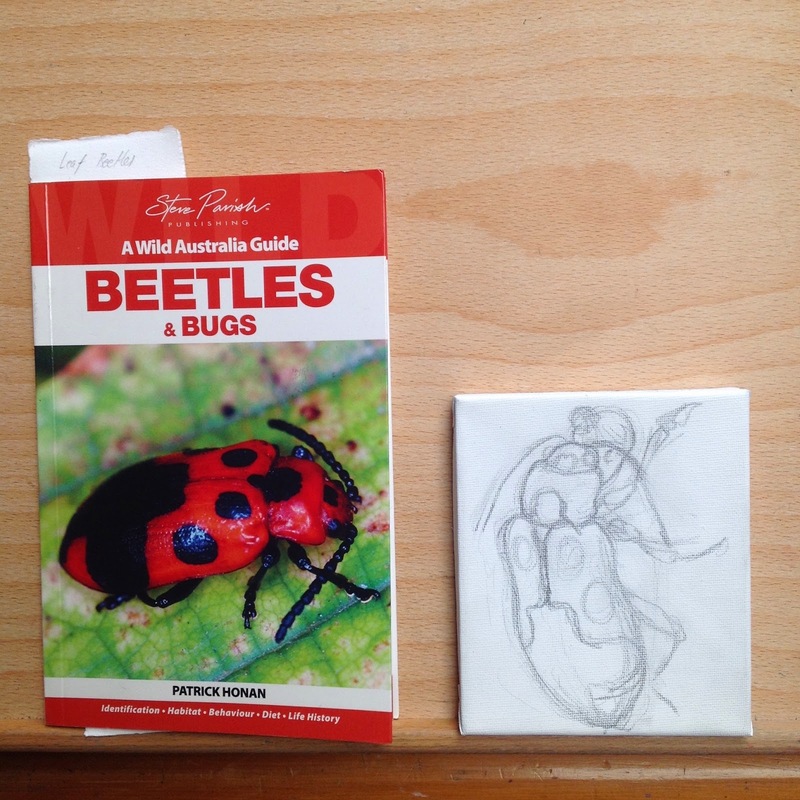 Red and Blue Leaf Beetle Woman is not destined for such a closeted existence, however. Under the auspices of the project Looking Down Under: Australian Contemporary Art, she is one of 200 works heading for Italy, where they will become part of the Luciano Bennetton Imago Mundi Collection.